Size: 5/8" 7/10" 3/4" 13/16" 7/8" 1"
75 Series Master Cylinders are designed for applications where space limitations require a compact master cylinder. 75 Series is 2.4" shorter than 74 Series Master Cylinders yet maintain a full 1.1" of stroke. Aluminum alloy body is black anodized for corrosion resistance. 1.1" of stroke provides the fluid displacement needed for a wide variety of applications. Industry standard 2.25" (center-to-center) front flange mount. Weighs .63 lbs (varies by bore size). 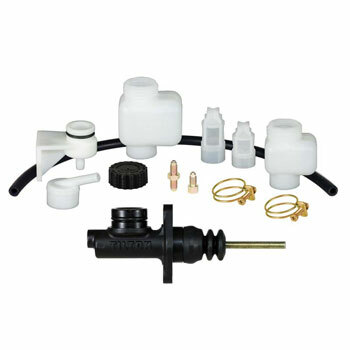 remote reservoir mounting components, and fittings. * Links below may link to off-site reference files and are not controlled by VAC Motorsports.